(CNN) - In a declaration laden with veiled jabs at NBA all star LeBron James, Ohio Gov. 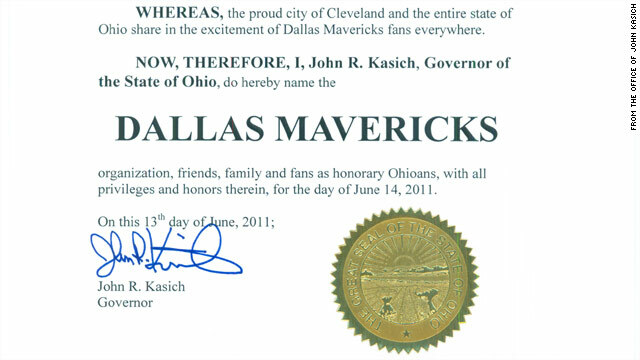 John Kasich on Monday declared the Dallas Mavericks honorary Ohioans. The move came less than 24 hours after the Mavericks defeated James and the Miami Heat in game six of the NBA Finals to win their first ever NBA championship. "Whereas, NBA Finals [MVP] Dirk Nowitzki chose to re-sign with the Dallas Mavericks in the summer of 2010, forgoing free agency and keeping his talents in Dallas, remaining loyal to the team, city and fans for whom he played his entire career," the declaration reads in part. James played his first seven NBA seasons with the Cleveland Cavaliers before announcing last July in a highly publicized prime time television special that he would leave Cleveland to team up with a spate of other all-star players in Miami. The move instantly soured James' relationship with Cavaliers fans and pretty much everyone else in Ohio. "Whereas, the proud city of Cleveland and the entire state of Ohio share in the excitement of the Dallas Mavericks fans everywhere," Kasich's declaration added. No word yet on how the Mavericks players and fans will take advantage of all of the "privileges and honors" that come with their new honorary citizenship. She took you for a ride in the divorce, eh Marcelo? You all need to chill. Doesn't take a Governor five minutes to type an email to a low-level staffer, have the staff make the certificate, and then for the Governor to sign it. Some of you make it sound like a Governor invested an entire day and tons of thought into the thing. Please, please, please don't equate the people of Ohio with it's governor! Okay, maybe we elected him but, hopefully, we Ohioans see the error of our ways and will correct our mistake in the next governor's election. You are so worry about Lebron James losing the title in the NBA Finals instead of creating jobs, stop the rampant crimes happening in the Cleveland area and what about people losing their homes to foreclosures. You are a disgrace to the people of Ohio and the United States. Grow up and get ovet it you moron! Players change teams, owners change players its the way things work. Ohio is home, I grew up there and lately it's been hard to stick up for with this whiny b*tches in Cleveland. Newsflash: of Ohioans wanted him to leave 2 and 3 years ago. We have education issues out the whazoo and our "leader" has the stones to pull this crap! WOW come on Ohio we're better than this! Aren't we?!?! You people need to lighten up! It's entertainment at its best! And people still question why Lebron left Ohio? I am embarrassed to be an Ohioan, with an idiot for a Governor. This guy sounds like a 4 year old..."you left us Lebron, so take this." What Governor does this? Oh yeah...ours. SMH. Tomorrow is Lebron James day, everyone gets to leave work 12 minutes early.